Despite surging anti-globalisation, protectionism and unilateralism, the G20 summit in Buenos Aires managed to bring members to reiterate their commitment to the overall trend of openness and integration. In line with this trend, Chinese president Xi Jinping made four proposals at the summit, contributing China’s wisdom to international efforts to keep the world economy on the right track. G20 is pivotal in steering global growth and will have a bigger role to play in world economic governance in the next stage. Members should support G20 mechanisms and take a long-term view with regard to the concepts and paths of its development. This, in my view, requires them to be open, be partners and be inclusive. 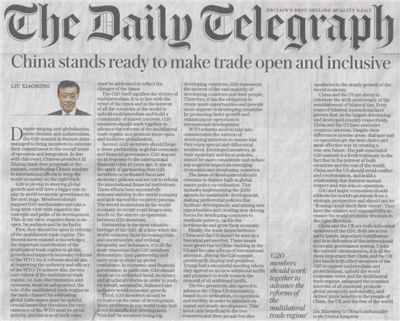 First, they should be open to reforms of the multilateral trade regime. The Buenos Aires summit acknowledges the important contribution of the multilateral trade regime to global growth and supports necessary reforms of the WTO. Such reforms should aim at improving the authority and efficacy of the WTO. To achieve this, the two core values of the multilateral trade regime, i.e. non-discrimination and openness, must be safeguarded, the role of the multilateral trade regime as the main channel for addressing global trade issues must be upheld, crucial issues that threatens the very existence of the WTO must be given priority, and fairness of trade rules must be addressed to reflect the changes of the times. The G20 itself signifies the victory of multilateralism. It is in line with the trend of the times and in the interest of all the countries of the world to uphold multilateralism and build a community of shared interests. G20 members should work together to advance the reforms of the multilateral trade regime and promote more open and inclusive globalisation. Second, G20 members should forge a closer partnership in global economic and financial governance. G20 was set up in response to the international financial crisis 10 years ago. It was in the spirit of partnership that G20 members co-ordinated fiscal and monetary policies and set out to reform the international financial institutions. These efforts have successfully restored stability in the world economy and kick-started the recovery process. The sound momentum in the world economy in recent years hinges very much on the sincere co-operation between G20 members. Partnership is the most valuable heritage of the G20. At a time when the world economy faces increasing risks and uncertainties, and striking inequality and imbalance, it is all the more important that G20 members demonstrate their partnership and unity so as to shore up global confidence. In economic and financial governance, in particular, G20 should insist on co-ordinated fiscal, monetary and structural reforms in order to push for robust, sustainable, balanced and inclusive world economic growth. Third, G20 members should be inclusive on the issue of development. Many problems in our world today boil down to insufficient development. With half its members being big developing countries, G20 represents the interest of the vast majority of developing countries and their people. Therefore, it has the obligation to create more opportunities and provide more support to developing countries by promoting faster growth and enhancing co-operation on international development. WTO reforms need to take into consideration the interest of developing members to ensure that they enjoy special and differential treatment. Developed members, in their monetary and fiscal policies, should be more considerate and reduce any negative impact on emerging economies and developing countries. The issue of development should continue to feature high in global macro policy co-ordination. This includes implementing the 2030 agenda for sustainable development, making preferential policies that facilitate development, and seizing new opportunities and creating new driving forces for developing countries to eradicate poverty, tackle the bottlenecks and grow their economy. Finally, the trade issues between China and the US should be seen in a historical perspective. These issues have given rise to China-bashing in the US and become a focus of international attention. During the G20 summit, president Xi Jinping and president Trump had a successful meeting where they agreed on no new additional tariffs and promised to work towards the removal of all additional tariffs. The two presidents also agreed to advance the China-US relationship based on co-ordination, co-operation and stability in order to maintain its sound and steady development. This is not only beneficial to the two countries and their people but also conducive to the steady growth of the world economy. China and the US are about to celebrate the 40th anniversary of the establishment of bilateral ties. Forty years of bilateral interactions have proven that, as the largest developing and developed country respectively, China and the US have extensive common interests. Despite their differences in some areas, dialogue and co-operation are the best choice and most effective way in creating a win-win future. The just-concluded G20 summit is a fresh testimony to the fact that in the interest of both countries and the rest of the world, China and the US should avoid conflict and confrontation, and build a relationship that features mutual respect and win-win co-operation. G20 and major economies should address the world’s problems from a strategic perspective and should not let “floating cloud block their vision”. They have the mission and responsibility to ensure the world economy develops in the right direction. 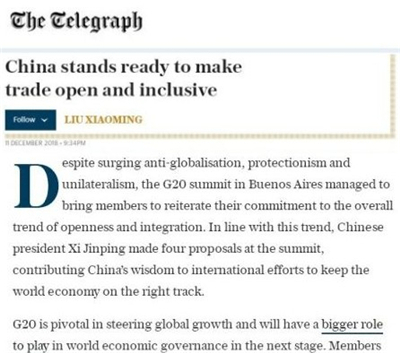 China and the UK are both influential members of the G20. Both are active participants, important contributors and firm defenders of the international economic governance system. Under the current circumstances, it is all the more important that China and the UK join hands with other members of the G20 to oppose unilateralism and protectionism, uphold the world economic order and the multilateral trade regime, safeguard the common interests of all mankind, promote global prosperity and stability, and deliver more benefits to the people of China, the UK and the rest of the world.